More realistic soul gem crafting as well as optional craft-able star and two new soul gems. Also brings back the Shade of the Revenant. Please see InsanitySorrow's and RefurbMadness' permissions (URLs provided above and below) if you wish to use their assets. InsanitySorrow for Insanity's Soul Gem Replacer 1.0 modder's resource. "For souls, prey species will almost universally have petty souls. 1-2 exceptions for lesser souls. Smaller and weaker predators will have lesser souls (wolves), and can level anywhere in the 'lesser' soul range. Atypical wolves may have up to 'common' level souls. Bigger predators will have common and greater souls, such as brown bears, cave bears and trolls. Giants are also capped (but by no means hindered) with greater souls. Apex predators (snowy variants or large predators) and very large prey (mammoths) have grand souls, as usual." Allows for release of souls in gems and sundering full gems to multiple smaller gems. Supports a weekly non-animated 'shade of the revenant', where you will be able to convert empty grand soul gems to empty black soul gems. 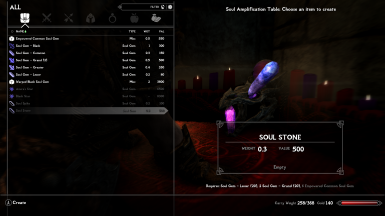 Soul gems and crafting pieces that are used in this mod are from InsanitySorrow's Insanity's Soul Gem Replacer 1.0 modder's resource (Morrowind-style soul gem meshes and textures). 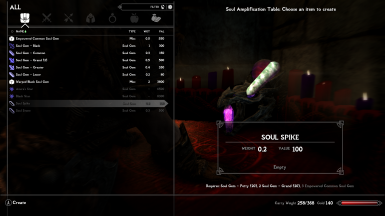 Soul Amplification Table is from RefurbMadness' Cherrywood Dragon Enchanting Table - Resource. Both mods are listed as open permissions so long as credit is given and no money is charged (please see linked sites for specific permissions before you use their assets for yourself). Please leave an endorsement on their page if you liked their work! Now to the lore: When Malyn was experimenting on Azura's star, he was also studying how it was made with the aim to create a facsimile in case his experiments failed. He postulated several ways to upgrade soul gems using the soul amplification table located in the college of Winterhold, but was unable to try any of his experiments before he was kicked out. He continued his research in Ilinalta's Deep, and before succeeding in transferring his soul over to the star, he locked some of his strength away in his Grimoire in the event he had to leave the star and retake corporeal form. After his defeat, his knowledge and the last vestiges of his strength found in the grimoire can be used to make a facsimile star, and lower-tier indestructible soul gems. Alternately, for those with high enough enchanting and conjuration levels, they can study a sigil stone and use some of the knowledge garnered to make indestructible petty and lesser soul gems. You are also able to release souls from gems at any level, or sacrifice the soul to break down the gem into more, smaller gems. If you do not know enough about enchanting, the souls in the soul gems are used up in amplifying the soul gem. Soul gems without souls cannot react with the soul amplification table, and so cannot be remade into large soul gems. All recipes that get improved will remove the less desirable recipe when the level requirement is met (ie losing the soul in upgrading). Recipes are based on total capacity that is available per gem: Petty(250), Lesser(500), Common(1000), Greater(2000), Grand(3000). 'Dawn' recipes require you to be at the amplification table between 4am and 6am. 'Dusk' recipes require you to be at the amplification table between 6pm and 8pm. 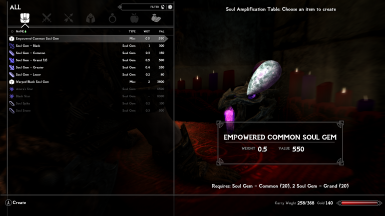 Ability to craft Empowered Common Soul Gems using 2 filled greater soul gems and 1 unfilled common soul gem. Recipe is only active if you have Malyn's Grimoire or a sigil stone, and have not made the 3 specialty soul gems. Craft additional gems for display case ornamentation prior to creating all 3 if you want them (or store a gem somewhere). Ability to craft a Soul Stone (infinite lesser soul gem) using 6 empowered common soul gems and 1 unfilled lesser soul gem (with Malyn's Grimoire or a Sigil Stone). 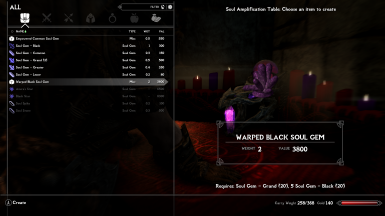 Ability to craft Warped Black Soul gems (only used for the Black Star, or as decor) from 5 filled black soul gems and 1 unfilled grand soul gem. Requires Malyn's Grimoire, so if you want a fancy doorstop, craft an extra before making the star. Ability to create the Star Base at the Skyforge (with 25 smiting) from 2 unfilled grand soul gems, 6 gold ingots, 4 flawless diamonds, and 4 flawless rubies. Ability to create Azura's Star (if you chose the black star) from 1 star base, 8 empowered common soul gems, 2 silver ingots, 2 frost salts, 2 filled grand soul gems and the remaining strength of Malyn's Grimoire. Ability to create The Black Star (if you chose Azura's star) from 1 star base, 2 warped black soul gems, 2 ebony ingots, 2 void salts, 2 filled grand soul gems and the remaining strength of Malyn's Grimoire. As I do not plan to add any scripting to the mod, there will be no animation over the soul amplification table when the shade is active. Currently it requires you to know soul trap, and be able to cast it (level 25 conjuration). The shade will appear between 11pm on Wednesday --> 1am Thursday. While the original shade appeared every 8 days, I am unable to make a perpetually-running event to match without scripts, so weekly will have to do. Finally, I had originally intended this to be attached to a book (eg Necromancer's Moon), however that book is not available on Skyrim to my knowledge, so currently this ritual can be performed right off the bat, so long as you have a grand soul gem and meet the requirements. Additional recipes (possibly not limited to soul gems)? Install with NMM or your manager of choice. Alternately drag and drop the .bsa and .esp into the data folder and activate the .esp. Enjoy a more realistic soul-gem crafting experience. *should be safe to install mid-game. The reverse of what you did in the install. Cry, for loss of an awesome, aesthetic workbench. It looks really awesome in Castle Volkihar. *uninstalling mods mid-game is never recommended, though the impact from uninstalling this one should be minimal in the short-term. Unlike my other patches, this one drops several workbenches into Skyrim at the mentioned places, and moves a table and two chairs in castle volkihar. I am unaware of any conflicts currently. Please note any in the comments. Q: The price to make another X star is too expensive! Q: Can you make X recipe cheaper? A: Not likely to happen as there are a lot of other mods (usually that add recipes to a smelter) that allow for cheap combining of soul gems, and/or cheap/free stars. We are trying to be more realistic/lore friendly (if not compliant) here. Q: Can you make it so we can amplify empty soul gems? A: It's a *soul* amplifier. It uses soul energy to merge the gems. Q: Can you make it so we at least don't lose charge? A: That's the price of inexperience. Novices start young. Train more and you won't lose charges. Q: Why can't I make grand souls at level 1? A: In older TES games, you couldn't even attempt to pick a lock until you met its level requirements. This is the same. 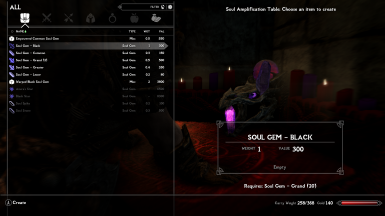 As mentioned before, there are a ton of other mods that let you craft soul gems empty, any kind of soul gem, at any level, etc. Those mods are also all kinds of unbalanced and broken. Q: Making stars isn't lore friendly? A: Are you actually asking..? Then put Malyn's Grimoire in a bookshelf. The recipe will never bother you again. Q: Can we get experience for crafting soul gems? A: I would love to, but making one gem usually gets me from 15 to 80+ enchanting for some gems when I enabled the option (trial run before I added level limits). Q: Why isn't the question I'm looking for shown? I need an answer! A: Comment away. That section is there for a reason.